What Makes Twins Special Gloves Good? What Makes Twin Special Gloves Bad? When you think of Muay Thai gear, you think of Twins Special. Twins have been a staple in the Muay Thai game for over 25 years. The best part about Twins Special is that everything they produce comes directly from the source in Thailand itself, the homeland of Muay Thai. There is just something very authentic and special about Muay Thai gear produced in Thailand from fighters who test out the equipment daily. Twins Special knows the perfect formula when it comes to designing and developing the best gear possible. This isn’t just with gloves however, they already produce some of the best shin guards available. Everything Twins Special produces is crafted with the highest possible quality and craftsmanship. Not only does Twins dominate the Muay Thai world, but they have also branched out into Boxing and MMA, as well as other combat sports. 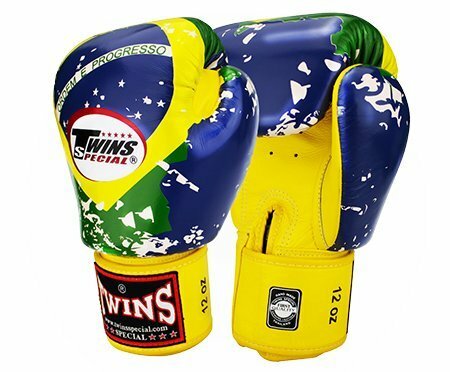 My first pair of Muay Thai gloves were a bright green pair of Twins Special gloves. These gloves lasted me a very long time and I can tell you all the good things that these gloves have to offer. Not only do I advocate for Twins Special because of their quality, I also will be honest and tell you the things that I don’t particularly like from Twins Special gloves. This is the most unbiased review that you will find online, because I genuinely do love Twin specials, however I love the integrity I stand for. Knowing that people can come to The MMA Guru looking for an honest product review means everything to me. The truth is, I only ever buy Muay Thai gear that comes directly from Thailand. This means brands like Twins Special, Fairtex, and Venum are all brands that I fully stand behind. Lets start with the design and construction of the Twins Special gloves. Almost all Twins Special gloves include a velcro wrist fastener which is made with the highest of quality. Seriously, I’ve owned these gloves for years and the velcro is still as good as the first day I bought them. It also means you can take your gloves off and on with a breeze. I love that nearly all Twins Special gloves are made with REAL leather (I wouldn’t ever buy synthetic leather gloves). This is very important for quality reasons, you never want to buy cheap leather. All of the models displayed today are made with 100% real leather of the highest quality. The air mesh is also a really nice touch for breathability. If you’re someone who sweats a lot or constantly feel like you have no circulation through your gloves then the Twins Special gloves are perfect for you. There are multiple vents in the inner side of the glove which allow them to be breathable. This is great especially when you’re someone who has a problem with smelly gloves. Last but not least, the overall look and design is absolutely amazing. There is various designs available, from the fancy boxing gloves, to the traditional solid colorway. If there’s one thing I can guarantee, it’s that these gloves look even better in person. Not much, if we’re being honest. These gloves took years to perfect, through many design flaws and mistakes made by the Twins team. However I think they have done an amazing job making the absolutely best Muay Thai equipment in the game today. The first “bad” thing I noticed about the glove was that it was very stiff at first. However, after owning a few more pairs of gloves I realized that this was a common theme that really can’t be avoided. After about a week of using them I finally felt like I broke that initial “stiffness” and my gloves felt great. Don’t be discouraged if you buy a pair and they feel stiff at first (especially the strap area), this will loosen up overtime. Another thing I noticed was that after the straps loosened up they kind of felt too loose around my wrist when I didn’t wear hand wraps (although you should ALWAYS wear hand wraps). Boxing gloves made from leather naturally stretch so there really isn’t much Twins can do about that, however I would always recommend wearing hand wraps to avoid this problem. If you’re the type of person who uses gloves without cleaning them for weeks, your Twins Special boxing gloves may start to smell. Again, this is something that can be avoided by cleaning them regularly. However I know people who never clean their gloves or training equipment (gross) and things like leather naturally start to smell. I highly recommend looking at our guide on how to keep your gloves clean and smelling fresh! The Twins Special Boxing Gloves are good for bag work. The reason I originally purchased my Twins gloves was for heavy bag use and pad work, they did outstanding from the very beginning. I will say one thing though, if you plan on hitting the heavy bag much more than the pads I would size up. 12 ounce gloves are smaller which means they have less padding and protection for heavy bag use. If you’re buying these gloves primarily for heavy bag use, I highly recommend sizing up to 14 or 16 ounces. 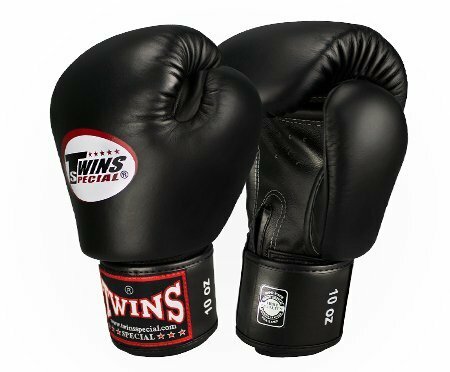 We also included the Twins Special boxing gloves on our Top 10 Boxing Gloves for Heavy Bag Use article. The Twins Special Boxing Gloves work best for pad work. However, unlike bag work I would suggest sizing down to hit pads with 10 to 12 ounces. The Twins gloves make a beautiful sound when hitting the pads, it’s beautiful. Hitting pads is what this glove was built to do, it’s a great feeling when you bust out a combo in your Twins Special boxing gloves. These gloves are also great for clinching too, they have great wrist support which allow you to clinch your partner with no problem. I originally bought these gloves for a “do it your all” type of glove because I couldn’t afford multiple pairs of gloves at the time, and they didn’t disappoint. I originally started sparring with my Twins 12 ounce gloves but eventually sized up and bought another 16 ounce pair specifically for sparring. The gloves are highly padded which offer tons of protection for both you and your opponent. The padding gives you a good amount of protection for blocking when you shell up with a high guard. I actually included these gloves on my top 10 boxing gloves for sparring list. If you’re an experienced fighter I highly suggest buying two separate pairs of gloves: one for pad work, and one for sparring. The reason why is because when you’re an experienced fighter, chances are that you are hitting much harder than a beginner. 16 ounces will insure the safety of your partner, after all no one wants to be a bad sparring partner. The Twins Special Boxing Gloves Velcro are a complete beast when it comes to heavy bag, pad work, and sparring use. The trick is to get the best size that is suitable for your specific type of training. I myself bought a 12oz pair because I did a lot of heavy bag and pad work when I first started training Muay Thai. However if you plan on sparring a lot I would recommend getting a bigger pair (such as 14-16oz). The reason why these gloves are the standard of Muay Thai gloves are because of the supreme quality they are constructed with. Triple layer foam makes these gloves feel like pillows on your hands. The velcro strap is amazing for quickly getting your gloves back on after a water break. I can’t recommend these gloves enough, they truly are the most consistent of Muay Thai gloves. The Twins Special Signature Fancy Boxing Gloves feature distinctive art that allow you to express your personality and style. With so many styles to choose from, you are sure to find a Signature Glove that fits you. Like all Twins Special gloves, they provide long-lasting protection and outstanding comfort. Similar to the Twins Special Velcro Boxing Gloves, these gloves are great for bag work, pad work, and even sparring, it really all depends on the size of glove you purchase. I always recommend a 12oz for everyday use, however if you’re going to be sparring I would recommend purchasing a bigger glove (14-16oz). The Velcro wrist design is particularly supportive of your wrist, and the glove offers excellent hand protection. Twins Special gloves are internationally recognized as setting the highest standards of quality. Twins continue to innovate and work together with the world’s best fighters to produce equipment you can depend on. Overall we give the Twins Special Boxing Gloves a “Guru score” of a 9 out of 10. They perform flawlessly for pad work and sparring, however they aren’t the best gloves out there for hitting the heavy bag. The design is great and the overall look is very eye catching. With over 10+ designs and colors to choose from we believe everyone can find their perfect pair. The price-point is also affordable when compared to competitors such as Hayabusa and Fairtex.